If you love to knit cables, you’ll love knitting these socks! These toe-up socks have cable on the instep as well as up the back of the toe-up gusset heel and leg. 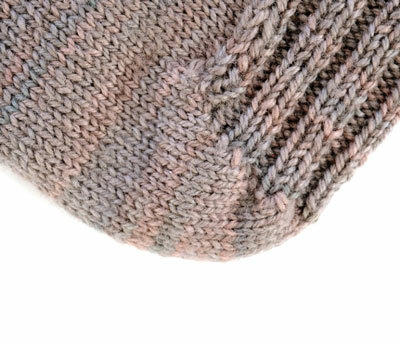 Work these cable socks on one long circular needle with Magic Loop. Because these socks are patterned heavily, the easiest way to size up or down is to change yarn or needle size—thinner yarn and/or smaller needles produce a smaller sock, while thicker yarn and/or larger needles produce a larger sock. Round 1: * K2, p2 *, rep from * to * around. CO 10 wraps (20 sts total) using the Eastern Cast-On. Arrange needles to work with the Magic Loop—Needle 1 refers to the first half of the round, Needle 2 refers to the second half of the round. Needle 1: Kfb, k to last st, kfb. Needle 2: Rep Needle 1. Needle 1: K1, m1, k to last st, m1, k1. Repeat rounds 2 and 3 until 30 (36) sts rem on each needle–60 (72) sts total. Next Round: P2, k2, m1, k3, pf&b, k7, m1, k7, pf&b, k3, m1, k2, p2, k30. 65 sts total. Next Round: P3, k2, m1, k3, p3, k7, m1, k7, p3, k3, m1, k2, p3, k36. 75 sts total. Next Round: P 2 (3), work Round 1 of Triple Cable A, p 2 (3), work Round 1 of Diamond Cable (Left Sock), p 2 (3), work Round 1 of Triple Cable B, p 2 (3), k 30 (36). Work even in cable patts on 35 (39) instep sts and work St st on 30 (36) sole sts until piece measures 6 (7) inches from toe, or 3.5 (4) inches less than desired total foot length. 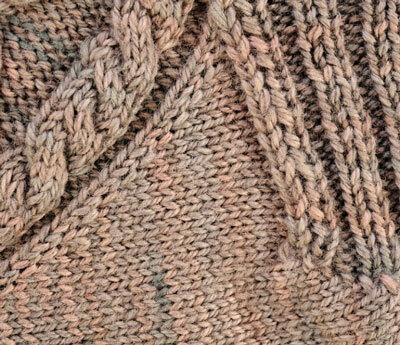 Work the increase for the gusset. Needle 1: Work across 35 (39) instep st in patt. Needle 2: K1, m1, k to last st, m1, k1. Work even in patts on all sts. Repeat rounds 1 and 2 14 (18) more times. 95 (113) sts total. 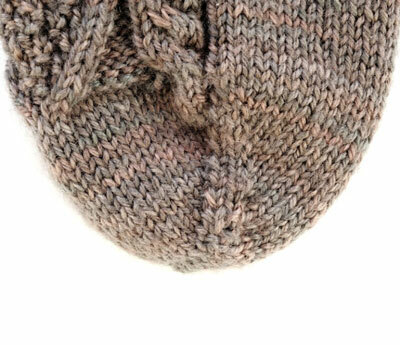 When you turn the heel, you work the short rows over 30 (36) sts. 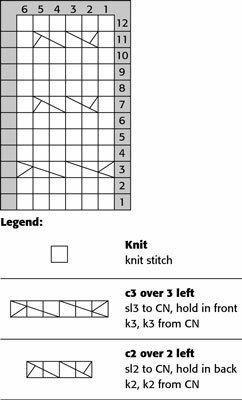 Needle 1: Work across 35 (39) instep sts in patt. 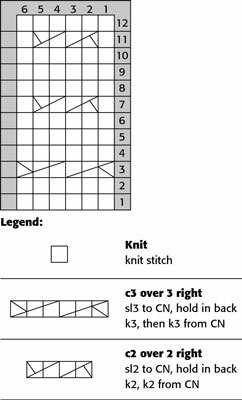 Note chart patt row just completed (you will return to charts after completing the heel). Needle 2: K 44 (54) sts. Wrap the next st and turn. Row 2 (WS): P 28 (34) sts. Wrap the next st and turn. Rep rows 3 and 4 until 11 (13) sts rem unwrapped in the middle of the heel, ending with a row 3. Next Row (WS): P 11 (13) sts. Continue purling across, picking up each wrap and purling it together with its st, to the last wrapped st. Pick up last wrap and p3tog the wrap, st, and following st. Turn without wrapping. Next Row (RS): Sl 1, k across, picking up wraps and working each wrap together with its st, to the last wrapped st. Pick up last wrap and sssk wrap, st, and following st. Turn without wrapping. Work the gusset decreases and heel flap according to size. Row 1 (WS): Sl 1, p1, [k2, p2] across 24 sts, k2, p1, p2tog. Turn. Row 2 (RS): Sl 1, k1, [p2, k2] across 24 sts, p2, k1, ssk. Turn. Rep rows 1 and 2 14 more times. 30 sts rem on Needle 2. 14 sts, p1, p2tog. Turn. Row 2 (RS): Sl 1, k1, [p2, k2] across 32 sts, p2, k1, ssk. Turn. Rep rows 1 and 2 18 more times. 34 sts rem on Needle 2. Work the leg and cuff. Work even on all 65 (73) sts in charted cable patts over instep and established 2 x 2 Rib over back of leg until work measures 8 inches or 2 inches less than desired length. 2a.Women’s size only: Next Round: P2, [k2, p2] three times, k2, p1, p2tog, [k2, p2] four times, work in established 2 x 2 Rib to end. 2b.Men’s size only: Next Round: P1, p2tog, [k2, p2, k2], p1, p2tog, [k2, p2, k2], p1, p2tog, [k2, p2, k2], p1, p2tog, [k2, p2, k2], p1, p2tog, work in established 2 x 2 Rib to end. Work even in 2 x 2 Rib for 2 inches or until desired length.